But the critical tone of the preliminary report by OSCE Office for Democracy and Human Rights (ODHIR) caught the authorities off guard. In large part, this was because ODIHR reports have cottoned on to the fact that the damage is usually done long before voting day itself, when the authorities build their various advantages into the structure of the campaign. So ODIHR front-loaded its report by criticising the ‘lack of a level playing field, caused primarily by the abuse of administrative resources, lack of transparency of campaign and party financing, and [overall] lack of balanced media coverage’, and referring directly to the cases of Yuliia Tymoshenko and Yurii Lutsenko, stating clearly that ‘the fact that they were not able to run as candidates negatively affected the election process’. Problems have also been end-loaded. The surprising vitality of the opposition challenge led to a suspicious delay in the turnout count and then to crude attempts to fix the count in the week after the elections in several key constituencies. In Obukhiv near Kiev the results in 28 polling stations were the opposition led were crudely struck off to convert a loss by over 8,000 votes to a 1,169 vote victory for the Party of Regions’ candidate Tetiana Zasukha. In the southern city of Pervomaisk, where victorious opposition candidate Arkadii Kornatskyi was trying to defend his agro-company from raiderstvo , the police dispersed demonstrators and carried off voting protocols. The local election commission chairwoman even faked a fainting fit and smuggled away her official stamp to prevent an opposition win being ratified. In Kaniv, burial place of the national poet Taras Shevchenko, the election commission defied a parallel count to declare ‘independent’ oligarch Bohdan Hubskyi the winner. 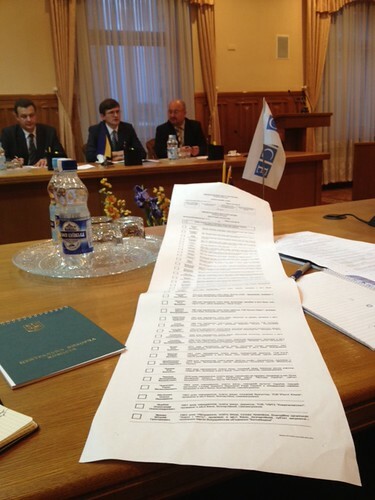 On 5 November the Central Election Commission controversially asked for a rerun, not a recount, in all three; and doubled the controversy by adding two more constituencies in Kiev and Cherkasy, where the opposition had been in front. The exit polls of course only predicted the vote in one half of the elections. The authorities won because the results in the territorial constituencies were very different from the PR side of the vote (unlike the recent vote in Georgia, despite some predictions that Saakashvilis’s ruling United National Movement would attempt to hang on to power by fixing the vote in the constituencies). In Ukraine, the Party of Regions won 73 PR seats, but 114 constituencies; the three main opposition parties won 120 PR seats and 60 constituencies. The Party of Regions also hopes most of the 44 ‘independents’ elected in the constituencies (in central and western Ukraine the ‘independent’ was often the real Party of Regions’ candidate, running alongside a dummy with a formal ‘Regions’ label), plus the seven representatives of smaller parties, will join with it or vote with it. The ODIHR report contains an astute passage on how the Party of Regions divided its efforts between the two sets of elections: vote-buying to distort the PR vote and ‘administrative resources’ in the constituencies. Clearly the opposition shot itself in the foot (though UDAR and Freedom were not then in parliament) by agreeing to the new election law in November 2011, that brought back the constituencies. But the opposition can’t complain the election was stolen from them on the day. A few races were clearly fixed; but the opposition lost because the rules were changed beforehand. Some Ukrainian activists, however, have supported the return of the territorial system (last used in 2002), arguing that the old method of electing all MPs from closed national lists dominated by oligarchs was too remote; whereas the constituencies this time have stimulated strong local campaigns and closer engagement by civic groups – and protest campaigns to protect local votes. A series of civic campaigns supposedly helps explain the higher turnout in Kiev – 62% against the national average of 58% – reversing the tendency in many previous elections for turnout in the capital actually to be below average. And ODIHR was clearly right to look more broadly at due process, both before and after election day itself. ODIHR did a good job, despite that job getting more difficult, as regimes get more sophisticated at hiding problems and shifting their efforts away from ballot stuffing towards ‘organising victory’ through the way they structure the election process. (And the way they fix the participant list – I have always argued that monitors should pay as much attention to ‘political technology’, as they do to crude fraud). Election monitoring is increasingly about more than just ‘observation’ – many problems are not so easily or directly observable. On the other hand, it may be beyond ODIHR’s remit and resources to look at every defect of a given political system; so it may need a little help in time. This article was first posted on the blog of the European Council for Foreign Relations.